1. What is the standard for good product quality through the type shot blasting machine? Through the type shot blasting machine, the standard of good product quality, its specific is: the product quality is qualified and the quality is good, and it can be durable. During use, it is not prone to failure problems, can be used normally and is highly efficient to use. In addition, the equipment is stable, safe and reliable, and has a long life span. 2. Through the type of shot blasting machine, which materials can it be used on? 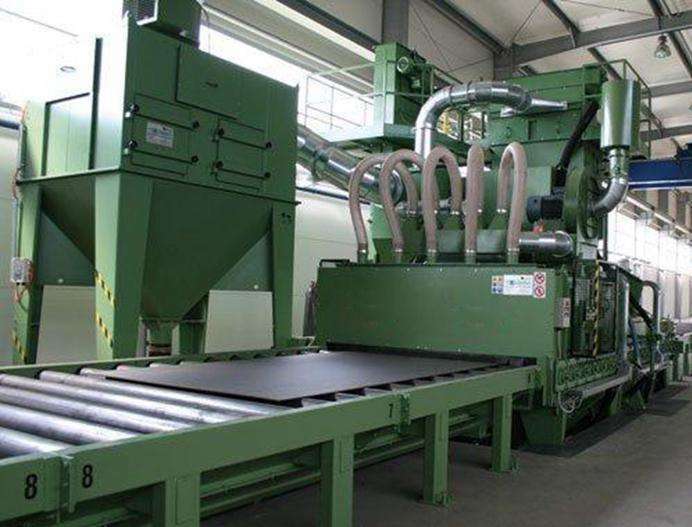 Through the type shot blasting machine, the materials that can be used are various kinds of rigid materials, such as steel plates, steel materials, steel beams, steel sections, steel pipes and steel castings, etc., and continuous uninterrupted work can be performed to remove the workpiece. The oxide scale, etc., as well as some pretreatment. This kind of shot blasting machine is very simple and convenient to operate. Just put the material on it and press the start button to start working. 3. How to avoid large vibrations in the shot blasting machine in the shot blasting machine? Want to avoid the large vibration of the shot blasting machine through the shot blasting machine, the following aspects need to be achieved: First, avoid serious wear and tear of the blade, keep it The balance of rotation; the second is to avoid serious wear of the impeller; the third is to do the lubrication of the bearing to avoid the bearing being burnt; the fourth is to check whether the fixing bolt of the blasting machine is loose or loose, and if so, timely Fasten to prevent loosening of the blast machine.